Great picks. Totoro is probably my favorite as well. Wasn’t a fan of Princess Mononoke (the story didn’t appeal to me) and still have to watch From Up On Poppy Hill. Have seen the rest in your list. Grave Of The Fireflies is really moving. Looking forward to checking out the new Ghbili documentary, which I have heard a lot of good things about. 🙂 I don’t even know all the names of the ones that I have seen, and there are so few I have seen in their entirety. The one I do remember liking, as weird as it was, was Spirited Away, but I watched that YEARS ago. These would totally be your cup of tea though hahaha. Ahh – yes, everyone seems to love Spirited Away. I tried that for the second time recently. Just can’t get into that one quite as much but I do like it. Hahaha! So disturbing. Luckily my kid doesn’t ask about it. If she does I’ll just tell her they’re in a hot tub. Hmm, interesting order. I’d put Ponyo much higher, and Spirited Away is my all-time favourite, closely followed by Howls Moving Castle. I still think Princess Mononoke is overrated. Good to see From Upon Poppy Hill getting some love though – sweet story. What about Arriety? 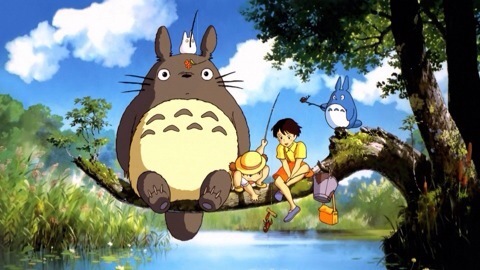 And finally, yes My Neighbour Totoro is utterly charming, but a bit too kiddie for my taste. If you haven’t seen it, The Cat Returns is also very good. So glad to see Totoro at the top of this list! Thanks, Alex! 🙂 People really do love Spirited Away… Have you seen Nausicaa? No, I need to see more for sure. Only seen six on your list. Thanks, Kim! And thanks so much for checking out my Ghibli stuff so far & all the retweets. 🙂 I have so much blog reading to catch up on! I’m so behind. 😦 Gotta love Totoro! Nothing can beat Totoro as a character. Very nice list, I forget that Grave of the Fireflies is a Ghibli film though not one directed by Miyazaki (and still one that I need to watch sometime, but I just know it’ll be such a downer). I remember my first was Mononoke, my favorite is probably Howl’s Moving Castle. Arriette is also another fun little movie when you get around to that one. Watched 6/10. I couldn’t forget grave of the Fireflies… Too sad. The only one I have ever seen is Grave of the Fireflies.. so weird!!!!!!!! I remember my gf used to love that and make me watch it. She also used to make me watch Unico.. have you ever seen that one? When comic con comes around I am going to find something of Totoro for you, they have so much stuff! See if you can find Unico or even a clip that one is sad too. I used to get seriously sad watching those… why the hell are they so sad, do you know? Is it a cultural thing? I know you know these random things…lol. OMG Comic con had tons I will look around this year see if there is anything cool. “Spirited Away” is one of my top ten films of all-time. I have “From Up on Poppy Hill” in my Netflix queue at the moment. Looking forward to seeing it (for the first time)! Thanks! That’s a shame about Totoro. I don’t think it’s as “good” of a film as Nausicaä but I love a great character so much & I think Totoro is a great one. : ) Whisper of the Heart is next on my list! Well… Maybe after The Wind Rises as that’s the only Miyazaki one I’ve not seen. John Denver, huh? Hmm… I’ll be watching the subtitled one – would it be his songs in the Japanese language one? It’s “Country Roads” to be exact. There’s an English and Japanese version whether you watch it dubbed or subtitled. Since that happens to be one of my favorite songs, it clinched the film as my favorite!